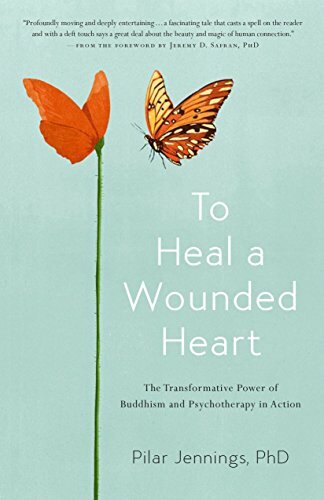 To Heal a Wounded Heart: The Transformative Power of Buddhism and Psychotherapy in Action by Pilar Jennings PhD is a tender and compassionate memoir of the experiences of an early career psychotherapist and a Buddhist monk who work to help a young girl heal from overwhelming childhood experiences. We all know someone who suffers from deep childhood wounds, wounds that impair one’s ability to have intimate, connected relationships. These wounds make a person’s world smaller and can lead to chronic conditions, both psychological and physical. There are many ways to try to make inroads against this suffering, using both psychotherapy and religion. Dr. Jennings looks at how the intersection of psychotherapy and Buddhism can help those who suffer deep childhood wounds to release their pain and capture the joy and vibrancy life has to offer. Part of the problem with deep childhood wounds is that they can be used to create “illness narratives.” An illness narrative is a story that we tell ourselves about how ill we are. In it, we can create our own shortcomings or limit our talents and use of personal power. We can tell ourselves that we are weak or have no voice and in doing so, make our world smaller. Our stories can in a certain way become self-fulfilling prophecies, a path to suffering. Changing that narrative is one pathway to developing greater connection and life satisfaction. Psychotherapy and Buddhism address suffering in different ways. Dr. Jennings sees these varied ways of addressing suffering as complementary. Used together, they were able to make inroads with the patient she presents in the book, a young girl who stops speaking. Psychotherapy is based on a therapeutic relationship. In this relationship, the client talks about his/her experiences with someone by whom they feel deeply heard. This relationship provides more safety than a friendship can, because the therapist is (or should be) outside the client’s social structure. The therapist is trained to hold space for the client, allowing the client to experience his/her grief and pain in safety. The development of appropriate vulnerability in the client, matched by appropriate boundaries in the therapist allows for the opportunity to unpack difficult feelings. In psychotherapy, the individual is able to sit with their pain and emotions until they are ready to move on from them. If psychotherapy allows an individual to take a close look at his/her problems, Buddhism takes a much broader and more universal view of situations. It teaches one to see suffering not necessarily as personal, but in a wider frame. By following a Buddhist practice, one can learn how to let go of the past and move beyond pain or attachment. Many Buddhists see joy as a choice and teach individuals how to choose joy despite circumstances, pain, or hardship. While some types of psychotherapy can be seen as navel-gazing or self-obsessive, that is not the desired outcome of quality psychotherapeutic practice. Both psychotherapy and Buddhism, though they employ different techniques, are paths to finding a life filled with expansiveness, connection, and compassion. They can be opportunities to create joy in the midst of hardship. Dr. Jennings’ book showcases the importance of including a transpersonal perspective in psychological or counseling practice. Transpersonal or spiritual psychology recognizes and integrates spiritual or transcendent aspects of the individual within psychotherapeutic experience. It focuses on the individual holistically, and brings the spiritual into attempts to treat mental illness and improve mental health. To Heal a Wounded Heart is a poignant story of a young girl who stops speaking because of early wounding. It can be read as an elaborate case study that sheds light on the lived experience not only of the young girl, but also the psychotherapist and Buddhist monk who work to help her. If you are looking for a tender story of healing and courage, of reaching beyond real pain to reconstruct your life, To Heal a Wounded Heart: The Transformative Power of Buddhism and Psychotherapy in Action by Pilar Jennings PhD should find its way onto your tablet or bedside table. The power to heal is real, and you will be encouraged by the bravery of those who have been hurt to find meaning and purpose in their lives.